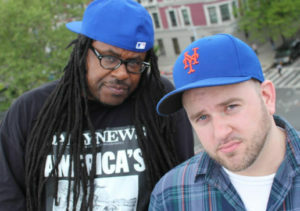 Saint and Emskee are a Hip-Hop duo known as The Good People. The group came onto the scene in 2006 with their self-titled debut album. The veteran east coast artists released several solo and group efforts for well over a decade that champion their early 90s brand of Hip-Hop. The Good People’s latest release is a 13-track album called Good for Nuthin’. Good for Nuthin’ is produced entirely by Saint and features appearances by Sadat X, Napoleon Da Legend, Large Professor, G Roc, Lil’ Fame, DJ C-Reality, Cella Dwellas, and the legendary DJ Red Alert. Emskee and Saint of The Good People spoke to The Real Hip-Hop about their golden era sound, the strong influence underground Hip-Hop has on the mainstream, and their new album, Good for Nuthin’. TRHH: Why’d you title the new album ‘Good for Nuthin’’? Emskee: We’re both forty-plus. In this day and age when you do music that’s related to your upbringing or childhood you’re deemed as old school or wack. With all of these tracks that we took six months to put together, we finally came up with a name for it. We’re pretty much good for nothing because a lot of people try to put the music that we make and put it in a box or put it in the past like, “It’s not new!” but it is new. Thus, Good for Nuthin’. Saint: The Good for Nuthin’ also comes from the style that we do – it doesn’t bring in a lot of money [laughs]. It’s not the style that would be played on commercial radio. We’re good for nothing. We’re doing it how we want to do it, not to chase the dollar. TRHH: The sound of Good for Nuthin’ reminds me of the late 80s/early 90s. How would you guys classify the Good People sound? Emskee: It’s good music [laughs]. Every artist says that about their stuff. I believe the state of where underground independent Hip-Hop is now I really don’t think there are a lot of groups that are coming out with the soul element in their music. There are a lot of rough samples. A lot of times now cats just rhyme over samples. There are no drums whatsoever. They just take a sample and rhyme over it. That’s great, but I think it’s time to get back to music. It’s time to put the soul back into your selections. I think we’ve done that effectively with this album and I think it’s resonating with a lot of people. TRHH: How did you guys get together to initially form The Good People and what are the origins of the name? Saint: I was working at a label called Seven Heads at the time. Back in 2006 I left the label and was working on a solo project. I was a fan of the Underground Railroad radio show where Emskee was a DJ on. I had a track that was an instrumental and I wanted somebody to put some scratches on top of it. I reached out to Em and he came through and put cuts on the track. He told me, “You know I rhyme too.” He put some verses on top of the track as well, which is a song called “These Times” which is on our first album. I basically just scratched the whole solo project. We were talking about the people within the industry – a lot of flaky emcees. We thought that we were some of the good people within the industry. I think that’s how we came up with the name. There’s levels to it [laughs]. TRHH: What inspired the song ‘Headphones’? Emskee: Saint and I are always looking for content to write about. All of that miscellaneous bravado on every song, it’s like, okay, cool you’ve got punchlines and your wordplay is cool, but it’s all about content. What are you talking about? I like to talk about things that a lot of people if not everybody can relate to. Saint sent me the track and I didn’t hear a single as I was writing it. I decided to write about headphones because it’s something that everybody uses almost every day. I wrote it, we did it, and put it on the shelf. That was basically it until we pulled the tracks out and started organizing them. Headphones was really good. We had a video made for it and the video itself for Headphones spearheaded our re-connection to releasing a record. The album followed up on January 15th and it’s been great. TRHH: Saint, the production on the album has that golden era sound; what does your production workstation consist of? How are you getting that sound today? Is it software or old drum machines? Saint: It’s an old drum machine. It’s done on the ASR which is made my Ensoniq. It’s a sampler that came out in the early 90s. It’s mostly done on there and put into Pro Tools. That machine is what gives us the sound that we have. TRHH: The song ‘Down Here’ speaks on how influential underground Hip-Hop is, yet so many people look down upon underground or backpack rap. When and why do you think underground Hip-Hop went from being the standard to something on the fringes of the culture? Emskee: Saint, you handle that because I don’t really know how to answer that question [laughs]. Saint: Back in the late 90s when Hip-Hop was really becoming more commercialized. The jiggy era came out and the underground scene branched off from there, I feel. Which was one continuation of what was going on in the earlier 90s when basically all Hip-Hop was underground. At that time, it was two different types of music within the Hip-Hop genre. I feel from there, like anything, time goes on and things get watered down. Different elements get mixed into it and basically ruined it. The underground scene in the beginning when it was new and more pure, it was dope. Other things came in and got mixed in and people went too far with it. It got kind of nerdy. It was about who could use the biggest words in the verses. I feel like that kind of ruined it a bit. I feel like we’re from that original underground sound, before it got kind of tainted with how people look at it now. TRHH: Emskee, on the song ‘Mahalia’ you rhyme about the struggles of being a black man in America. What would you say to those who’d say, “Stop complaining? It isn’t that bad. Black people have it better now than they’ve ever had it.”? Emskee: As Kanye said, “Slavery was a choice for black people,” [laughs]. My thing is this, I’m a black man and a lot of black people should wake up mad every single day. Because of the injustices and everything that’s happened from civil rights until now. We’re still facing a lot of, for lack of a better word, BS. You should wake up mad every day. At the same time, when you’re mad about stuff it’s wasteful energy. So, you have to find different channels of yourself to be able to bypass that anger every day that you should have and focus on what you can do for yourself to make yourself better. Hopefully, outside of that you can make everybody that you come in contact with better. And make them understand that there is a problem and there is some attention that should be paid to it. Saint sent me the beat and I just went to a place. I was going through a real rough time when I wrote that song. The content of that song was basically coming out from me being very upset and angry. Saint: To add on to that, for somebody to say the black community has it better now than they did before, okay, in the year 2019 it’s better than 1970 or the 1960s, okay, maybe it is a little better, but it’s nowhere near where it needs to be. For people to be like, “Okay, live with it, and take the little win that you have now!” it shouldn’t be that way. People are being more open about it and I feel like the more people talk about it, other people will be like, “He’s talking about it, so I can talk about it.” It’s coming out more and it should until it’s where it should be and everything is a lot more equal between everybody. The good thing is though, I think the younger generation is a lot more understanding. Younger people are a lot less racist than older people and less set in their ways. As time goes on it should get better, but we’ve got a ways to go. Emskee: I also think that because Donald Trump is president there’s a lot of ugly history that’s actually showing itself for people that were quiet for eight years while Barack Obama was president. I’m not going to say Barack Obama was the perfect president, because he wasn’t. But compared to what we have now Trump opened up the flood gates for a lot of rhetoric that was buried. It’s re-risen to the surface and we really have to pay attention to a lot of that and find out how we can balance everything out. TRHH: Who is the Good for Nuthin’ album made for? Emskee: Wow, that’s a really great question. I feel personally it’s made for people who want a little bit of soul back into their Hip-Hop – something that they can grasp. Look, we’re not street guys. A lot of Hip-Hop that’s made people either sound street or they wanna sound street. Don’t get it twisted, we’ll still put the hands on you if you violate, but at the same time there’s another avenue that we’re trying to create as far as getting away from all the violence. Like I said, personally I should wake up mad every day. People have problems every day and a lot of people are close to going postal, especially in this climate. But, we make music for ourselves, but at the same time when we’re presenting we just want to touch the soul of people and bring them back to a refreshing feeling in Hip-Hop. I think the right element of soul that we put into this album makes a huge difference. Also, the missing element is the sequencing of the albums. Most of the time in present day everybody is listening for the single and they don’t really care about the album. We come from the era where the proper sequencing of an album engages you. You listen to the first track and all of a sudden the second track comes on and you’re like, “Oh, this is cool, too. Let me listen to this.” If it’s not sequenced the right way you’re going to find yourself skipping around the album to find whatever you’re looking for. With this album, I think it’s sequenced just the right way where if you listen to one track you’ll listen to the next one and so forth. It’s just for people who want a refreshing touch of soul in their Hip-Hop again. This entry was posted in interview and tagged Brooklyn, Down Here, Emskee, Good for Nuthin’, Headphones, interview, Long Island, Mahalia, New York, New York City, NY, NYC, Saint, The Good People. Bookmark the permalink.